The first mixer for hot and cold water was invented by Lord Kelvin as early as the nineteenth century. New materials and technologies made it possible to create more sophisticated devices, aesthetic and comfortable. In this material we consider all types of mixers that are currently in use. Here you need to take into account the width and depth of the sink, picking up the faucet so that water does not splash outside. It depends on the height of the product, as well as the size and shape of the spout. It is also important how the device is attached to the sink. It is better if for this purpose serves the nut which needs to be screwed on the lower part of the case. 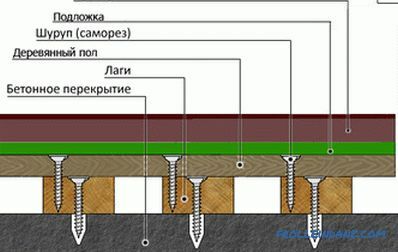 Fastening with studs (one or two) less secure. 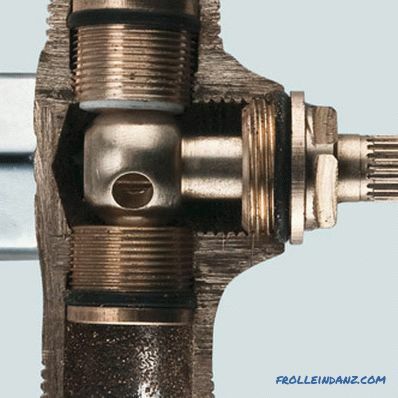 By the method of switching water products can be either valve or lever. About each of these types of sink mixers - on. 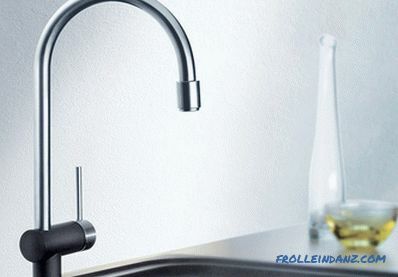 In this mixer, by turning the knobs located on the sides of the tap, you can change the pressure of hot or cold water, achieving desired temperature. These models are also called crane-box, since it is crane-box that serves as locking elements here. 1. The crankshaft of the worm type is a kind of traffic jam. The rod with a rubber gasket at the end overlaps the water (either completely or partially). Wrapping a crane with such a mechanism, you need to make a few turns and make an effort at the end. By the way, imported products have a softer effect on gaskets than domestic ones: in them the movement of the rod goes forward, not rotationally. 2. Crane-box with rotary ceramic plates , in which the holes are cut. When the holes coincide, water flows; when they do not coincide, it stops going. Fully wrap the valve with ceramics inside can only be half a turn. Therefore, it bears the second name - half-turn. Note the advantages and disadvantages of the crane-box mixers. The molded case is durable and reliable, it does not have a large amount moving parts. Interchangeability of parts is high, and repair is easy. A fairly low price (lower than single-lever products). Crane boxes are too diverse - you can make a mistake and buy the wrong part, what you need. And sometimes not find it on sale. Twisting the taps is necessary with two hands - this is a long time. And uncomfortable if the hands are not very clean. A lot of water is consumed - for the zealous owner it is important. 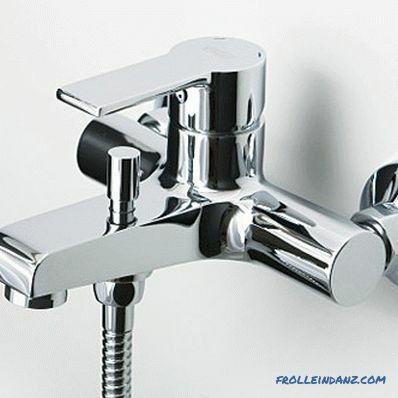 Single-tap (or single-lever) faucets have just one lever lever instead of two valves. 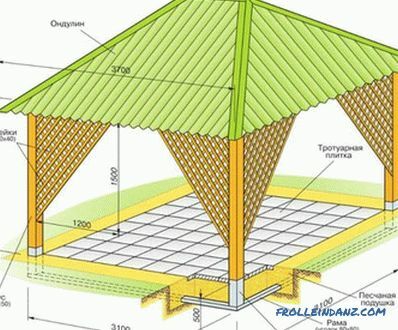 It can rotate in two planes, providing the necessary heating and water pressure. 1. 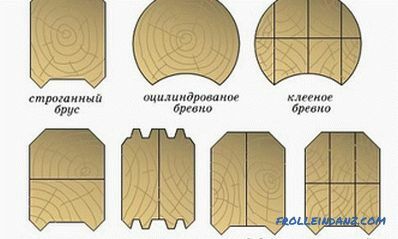 Sharov - inside is a hollow ball with holes. 2. Cartridge, inside it there are turning disks made of ceramic. Note that tight fitting parts inside the case react painfully to foreign matter in the water. Because of this, the mixer can fail - even a random grain of sand can damage the discs. To avoid this, put filters. 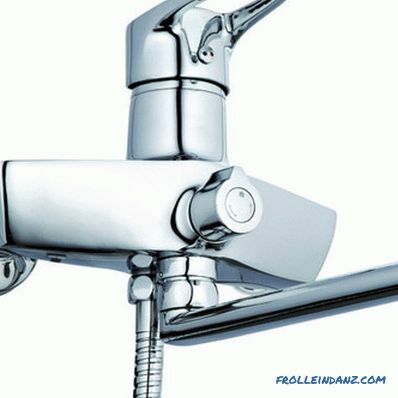 The body of the single lever mixer can be swivel or cast. 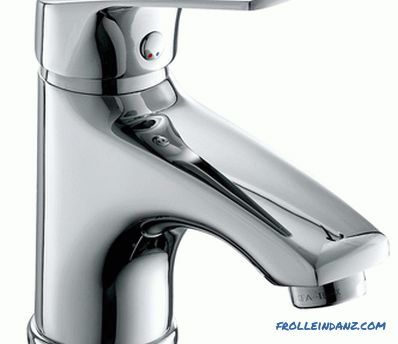 In this case, after fixing the device on the sink, its spout can be rotated. This is quite convenient. For example, when it is necessary to direct the faucet not to the sink, but to the bath. Yes, and wash the sink becomes easier. Usability (the lever can be pressed in one motion) and the speed of adjustment. And the surface of the mixer gets dirty to a minimum. If your hands are dirty, you can use the back of your hand or elbow. Longer (about twice) service life than a crane axle box. It is about ten years. The prices of these parts are on the same level, but during the repair, the cartridge will need one and the crane-axle box two. The movable case cannot show off its particular strength and can easily break. If the gasket that separates the inner part from the rotary one is worn out, the valve must be completely replaced. This item is extremely difficult to find. Sensitivity to pollution in water. The fewer moving parts, the less often the finished product breaks. This is an axiom, so a strong solid body will surely live longer than a swivel one. The only part that can be changed is a fixed spout. However, this design allows you to place the switch handle only on top. And this is not very convenient. Long Live case with easily replaced elements. 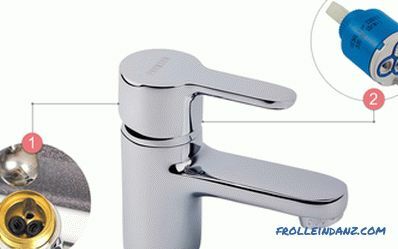 All the advantages of single-lever products described above. Cast mixers are taller, so water is often sprayed from them . The side grip isn't very comfortable. As with all cartridge products, it is sensitive to foreign particles in the water. 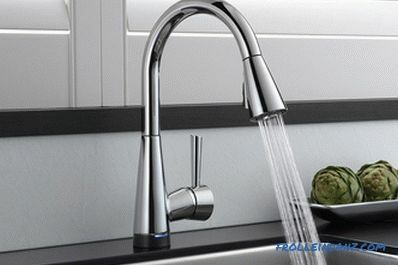 By design, the types of kitchen faucets are similar to those used for the sink in the bathroom. But they have one feature. Products installed in the kitchen sink should be of sufficient height. Otherwise it will not be possible with convenience to wash large pans or to draw water into them. Still sometimes equip kitchen products with a dispenser and a separate tap for drinking water. 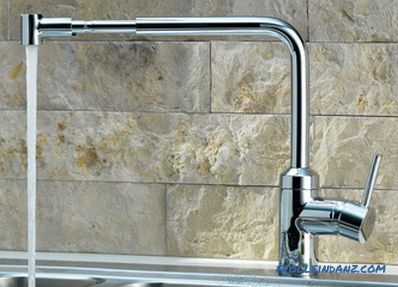 Long spout and swivel design (allowing you to get to all corners of the sink) is the best option. The greater the swivel angle of the spout, the more comfortable it is to use the device. Budget models have an angle of not more than 140 degrees, more expensive - 180 degrees. Sometimes the spout for greater comfort make flexible or retractable. The classic version with two flywheels is not very difficult to repair - any mechanic can handle. However, if the hands of the hostess in the dough or in oil, the taps will inevitably be stained - otherwise they will not open. Yes, and the water flows well through such a mixer. 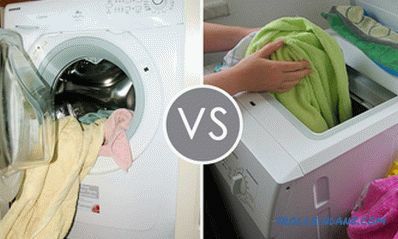 In general, the pros and cons are the same as for the devices described in the previous section. Turned on with the touch of a finger or the back of a hand, they are not afraid of dirty hands and are very relevant during cooking. 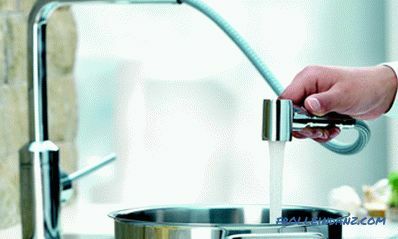 Therefore, one-armed mixers appear in more and more kitchens, displacing the valve taps from there. Their body can be integral or consisting of rotating parts. This design makes it easy to wash the soiled sink, as it supplies water to the maximum area. Or put a mountain of dirty dishes, pushing the faucet aside. This, of course, is a plus. But let's not forget about the shortcomings of the rotating body. They are already listed in the product description for the sink. This reduction in service life and rather rapid wear of parts subjected to friction. And in the kitchen, this factor is especially important, as the faucet is experiencing higher loads than in the bathroom. The molded case is a guarantee of durability. Perhaps it is the one-piece case that is most suitable for intense kitchen conditions. Such a model mixer faithfully and will last for many years. Is that the spouts with cartridges will have to be replaced periodically. And so that the water does not spray out of the high spout, its jet must be directed to the center of the sink. The only disadvantage is the lateral placement of the handle, which was already mentioned in the previous section. But here you need to choose what is more important: reliability or comfort. These types of bathroom faucets require an additional drain to which the shower hose is connected. 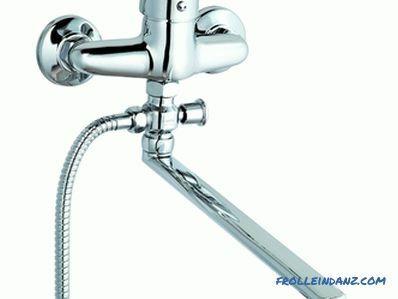 In addition, they have a mechanism at the right time switching water to the tap or shower. 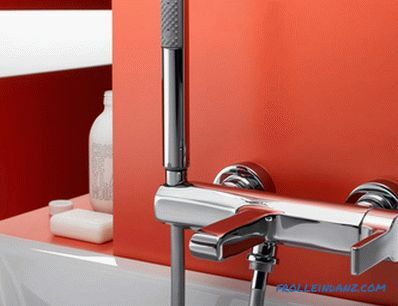 Like the faucets mounted above the sink, these devices have two valves and one-piece housing. But the mechanisms that switch the shower - spout, they can stand different, it is by this mechanism, and they differ. 1. Faucets with eccentric shower switching mechanism - spout . Such a device is most common. Its principle is as follows: turning the switch knob, we actuate the rod, on both sides of which there are rubber stoppers-gaskets. This rod, moving in a straight line, eventually closes one of the holes: for the shower or for the spout. 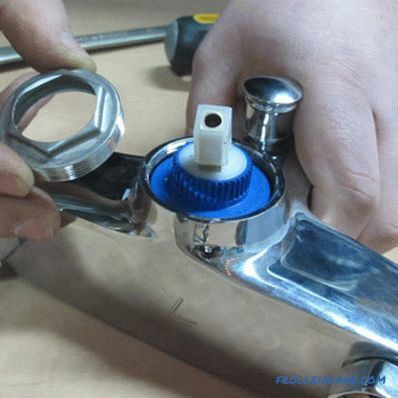 Repair of the mechanism is usually simple - just change the gasket. When more serious parts fail, you have to change the mechanism completely. But this is a laborious job, besides you have to disassemble the entire mixer. It is extremely difficult to find the mechanism separately for sale. 2. 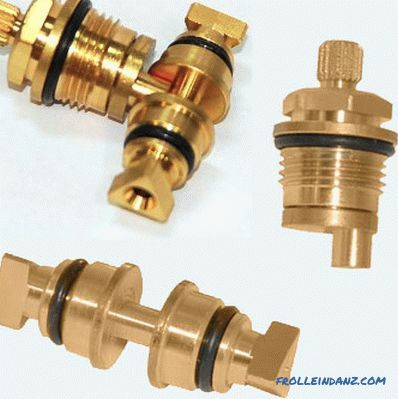 A faucet with a cartridge shower switching mechanism - spout . The device is structurally similar to a cartridge for a lever mixer, but it is smaller in size. It works the same way: ceramic plates, turn, skip or close water. He is able to serve for a long time without breaking. Changing it is much easier than a device with an eccentric. The cartridge is not repairable - it changes completely. 3. 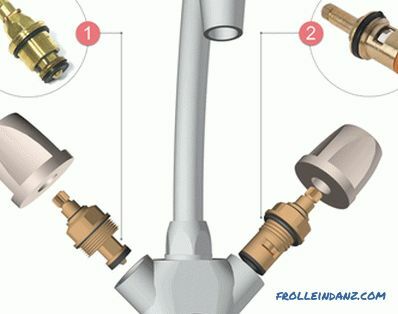 A faucet with a spherical shower-diverter - spout . There is a small ball-type stopcock here. Inside it has a brass ball, in which perpendicular holes are machined. When the switch is rotated, the ball occupies one of the fixed positions, and water flows through the corresponding holes. This model is the most enduring and reliable. 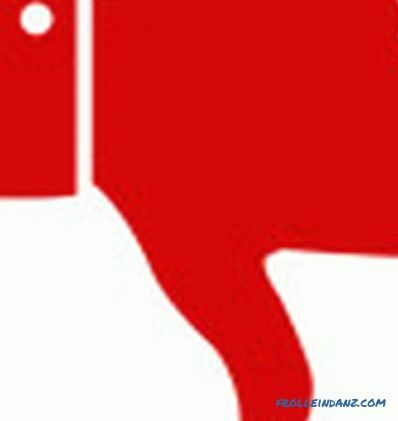 If the mechanism fails, it will not work to change it. We'll have to buy a new mixer. Here the construction is similar to the lever mixers described above. The only thing - the body of the bath-shower devices are always cast. 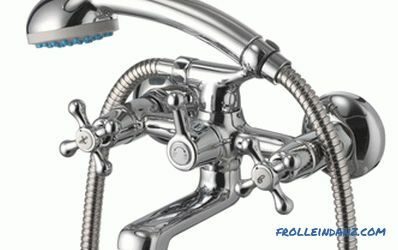 They differ in the type of switching mechanism from the spout to the shower. 1. 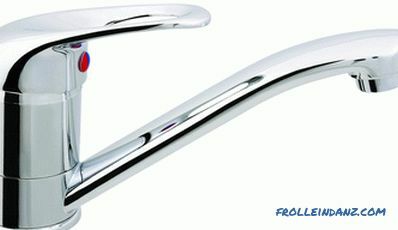 A faucet with o removable shower-switching mechanism - spout . It can be cork or rotary. The latter option is more convenient and modern. If the mechanism has stopped working, you need to remove it and put a new one. Disassembly design is not provided. These removable items are available in all stores. So repair mixer is not difficult. The dimensions of the mechanism are solid, and it requires additional space in the bottom of the mixer. When the spout is turned back and forth, the connections are loosened. 2. With built-in shower cork mechanism - spout . As in the eccentric device, there is a rod with rubber plugs (because of which the mechanism got its name). In order for the stem to start moving, you need to pull the switch knob towards you or press it. Small dimensions due to the built-in design. Sometimes the mechanism switches itself. Repair is extremely difficult, spare parts are not available. 3. The mixer with the built-in cartridge mechanism for switching the shower - spout. The cartridge cannot be repaired; in case of a breakdown, it will have to be replaced completely. 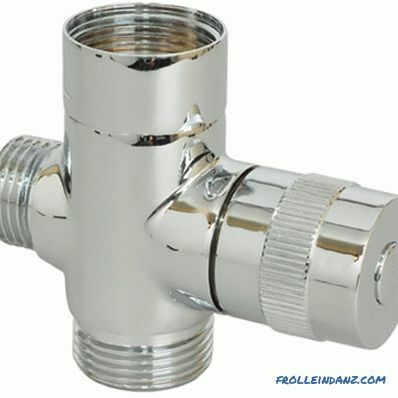 Equipped with two handles with fuses, they allow you to quickly vary the temperature (regulated by the first valve) and pressure (controlled by the second valve). Restrictive buttons on the handles make it possible to set the parameters that are needed. 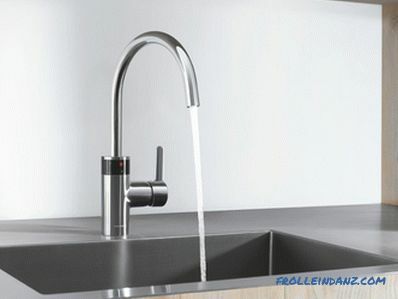 The next time, turning on the faucet, we get water with the desired temperature and pressure. Water Saving as fast as possible adjustments. Ability to set the desired parameters. This is convenient, for example, when bathing a child. These products are also called non-contact. They do not need to be turned on manually, as they are equipped with an infrared-type motion sensor. 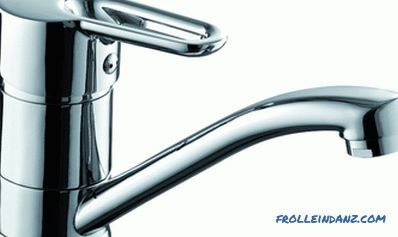 It is necessary to bring your hands to the faucet, as it starts to pour water. It is possible to regulate the sensor action area. The temperature is adjusted by a small lever. Hygiene - no direct surface contact with dirty hands. It is convenient for public bathrooms. Ease of use - no effort is required. 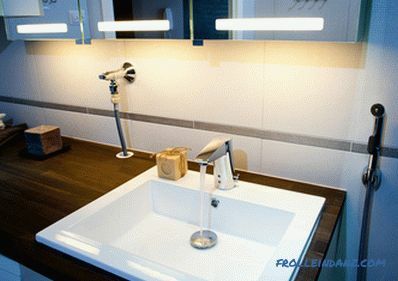 As a rule, they are bundled with an expensive bathroom and are built into its board special fixture. There are also models designed to be attached to an added cabinet. 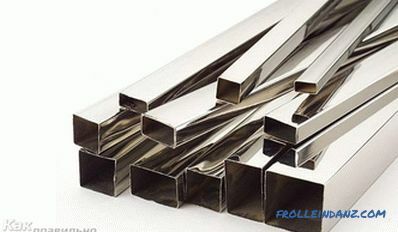 They are placed vertically, being used for installation on a sink or kitchen sink. Their installation and maintenance are quite simple. 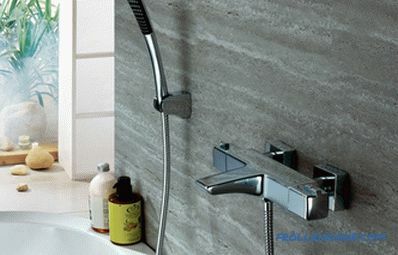 These are, as a rule, bath-and-shower products characterized by rigid installation. They are mounted near the plumbing, hiding fasteners under the cladding. Sometimes they are installed in a specially made niche in the wall. 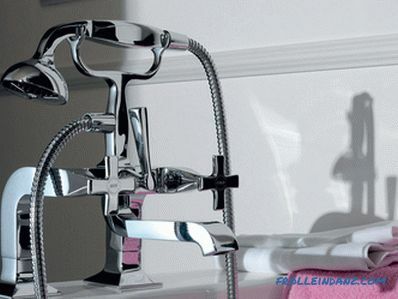 Difference of mixers by type of spout bathroom and bath-shower mixer. The size of this product is 20 centimeters or more.It can be useful in the kitchen, as it gives more space to wash your hands or dishes. 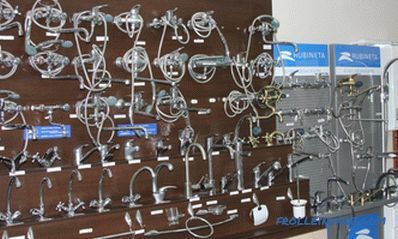 Having poured out more than 30 centimeters is necessary if there is one common mixer for a sink and a bathroom. Also relevant for kitchen conditions. Outwardly, he is no different from his fellows. But if you pull at its end, you can pull out a flexible hose up to 70 centimeters long. He helps to wash the sink, dishes, vegetables with fruit. 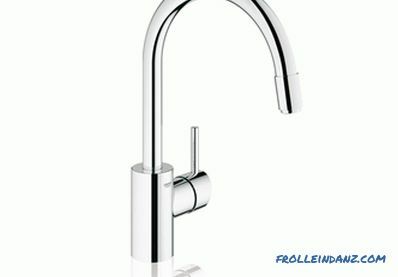 Kitchen faucet with flexible pull-out spout. 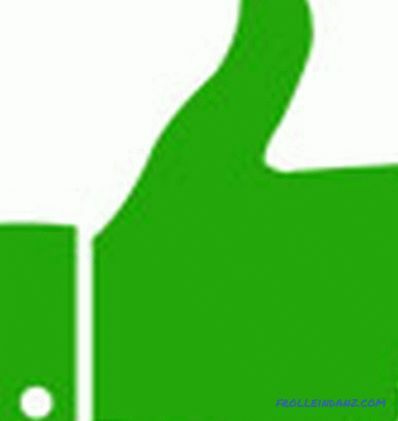 These are the best and most durable materials. But they are expensive. As a rule, the surface of brass mixers are nickel plated and chrome plated. It turns out practical and hygienic. It should beware of silumin products, a bit like brass. They are cheaper, but serve two years, not more. Not a bad option, more budget than bronze with brass, although not as durable. It is practical, beautiful and modern, and such a mixer fits any design. Ceramics looks stylish, and products made of it are distinguished by their special originality. Often they are even made in the form of fountains. However, the fragility of this material can play a cruel joke. In addition, ceramic faucets are the most expensive.